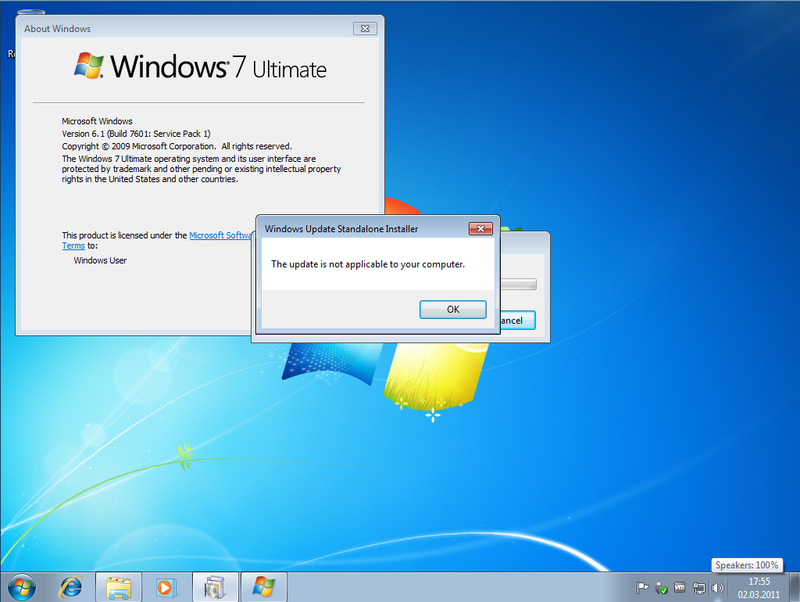 Microsoft released the Remote Server Administration Tools for Windows 7 with Service Pack 1 (SP1) now. Download and install the Update. If you already applied my Workaround, you can install the Update, I tried it and can't find any issue with installing the new RSAT update. This post was provided as a workaround. Don't use it any longer!!!!!!!! 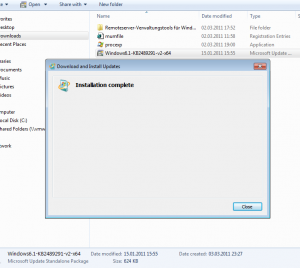 Get the Remote Server Administration Tools for Windows 7 with Service Pack 1 (SP1) and use this new installer!!!!!!!!!!!!!!!!! "This update is not applicable to your computer"
to extract the Sp1 CAB to D:\RSAT\sp1. 7. 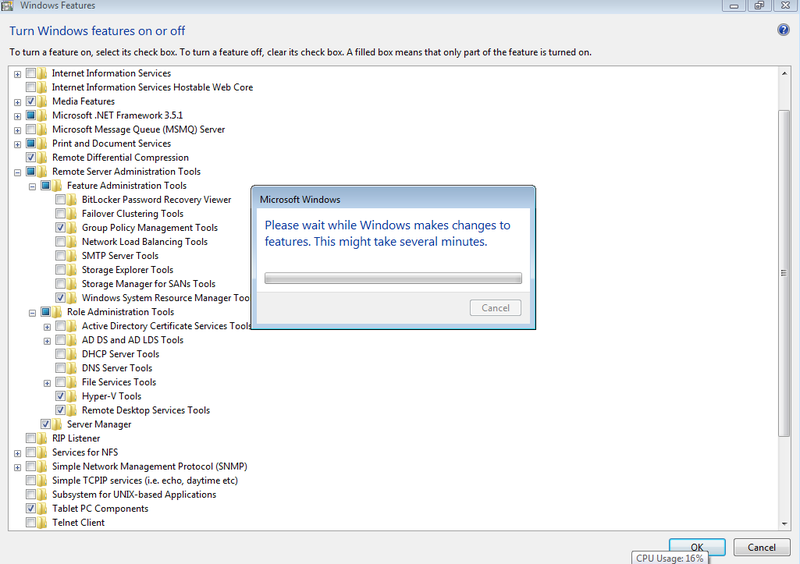 Reboot (if needed) and open "Turn Windows Features on or Off" and activate the RSAT Tools you want. 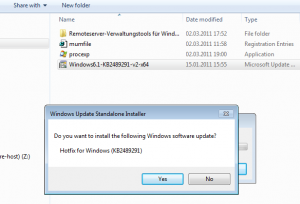 Enjoy the RSAT Tools in Windows 7 Sp1 until MS provides an Sp1 compatible Update in April. For a x64 Windows, replace x86 with amd64. Does this only work for Ultimate, or other versions as well? 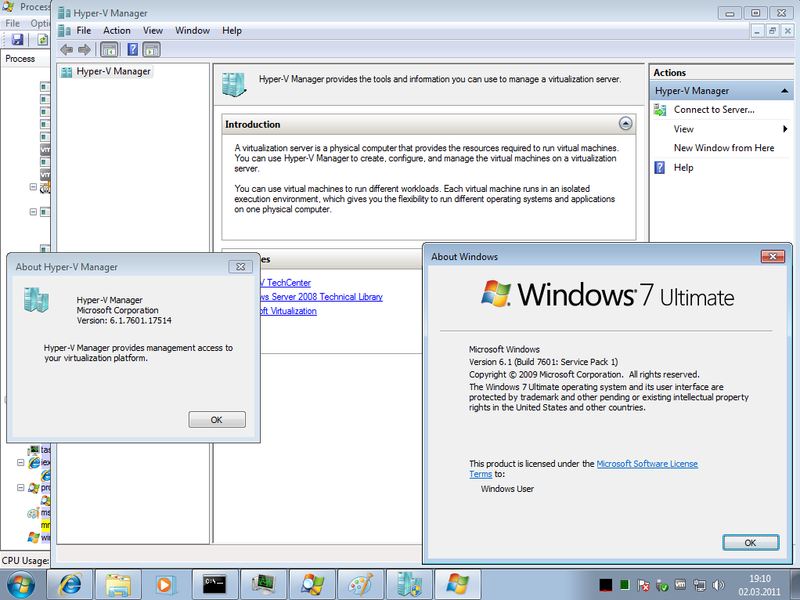 Don't use the Package Manager, it's deprecated in Windows 7. Use DISM instead. It's even more powerful and fully supported. (Sounds strange in thread like this, huh?). DISM.exe /Online /NoRestart /Add-Package /PackagePath:"microsoft-windows-remoteserveradministrationtools-package~31bf3856ad364e35~amd64~~6.1.7600.16385.mum" /PackagePath:"microsoft-windows-remoteserveradministrationtools-package~31bf3856ad364e35~amd64~en-us~6.1.7600.16385.mum" /PackagePath:"microsoft-windows-remoteserveradministrationtools-package-minilp~31bf3856ad364e35~amd64~en-us~6.1.7600.16385.mum" /PackagePath:"microsoft-windows-remoteserveradministrationtools-package~31bf3856ad364e35~amd64~~6.1.7601.17514.mum"
DISM.exe /Online /NoRestart /Enable-Feature /FeatureName:"RemoteServerAdministrationTools" /FeatureName:"RemoteServerAdministrationTools-ServerManager" /FeatureName:"RemoteServerAdministrationTools-Roles" /FeatureName:"RemoteServerAdministrationTools-Roles-CertificateServices" /FeatureName:"RemoteServerAdministrationTools-Roles-CertificateServices-CA" /FeatureName:"RemoteServerAdministrationTools-Roles-CertificateServices-OnlineResponder" /FeatureName:"RemoteServerAdministrationTools-Roles-AD" /FeatureName:"RemoteServerAdministrationTools-Roles-AD-DS" /FeatureName:"RemoteServerAdministrationTools-Roles-AD-DS-SnapIns" /FeatureName:"RemoteServerAdministrationTools-Roles-AD-DS-AdministrativeCenter" /FeatureName:"RemoteServerAdministrationTools-Roles-AD-DS-NIS" /FeatureName:"RemoteServerAdministrationTools-Roles-AD-LDS" /FeatureName:"RemoteServerAdministrationTools-Roles-AD-Powershell" /FeatureName:"RemoteServerAdministrationTools-Roles-DHCP" /FeatureName:"RemoteServerAdministrationTools-Roles-DNS" /FeatureName:"RemoteServerAdministrationTools-Roles-FileServices" /FeatureName:"RemoteServerAdministrationTools-Roles-FileServices-Dfs" /FeatureName:"RemoteServerAdministrationTools-Roles-FileServices-Fsrm" /FeatureName:"RemoteServerAdministrationTools-Roles-FileServices-StorageMgmt" /FeatureName:"RemoteServerAdministrationTools-Roles-HyperV" /FeatureName:"RemoteServerAdministrationTools-Roles-RDS" /FeatureName:"RemoteServerAdministrationTools-Features" /FeatureName:"RemoteServerAdministrationTools-Features-BitLocker" /FeatureName:"RemoteServerAdministrationTools-Features-Clustering" /FeatureName:"RemoteServerAdministrationTools-Features-GP" /FeatureName:"RemoteServerAdministrationTools-Features-LoadBalancing" /FeatureName:"RemoteServerAdministrationTools-Features-SmtpServer" /FeatureName:"RemoteServerAdministrationTools-Features-StorageExplorer" /FeatureName:"RemoteServerAdministrationTools-Features-StorageManager" /FeatureName:"RemoteServerAdministrationTools-Features-Wsrm" /FeatureName:"IIS-LegacySnapIn" /FeatureName:"IIS-IIS6ManagementCompatibility" /FeatureName:"IIS-WebServerManagementTools" /FeatureName:"IIS-WebServerRole" /FeatureName:"IIS-Metabase"
(this is still one line command). And you can ensure any post-SP1 hotfixes for various RSAT components install just fune on top of this nicely hacked setup. This gives us a hope we've done a decent job and we'll not be forced to re-image our machines once official RSAT SP1 package get released. thanks for the Feedback. I'm aware that DISM is the current version, I prefer the classic tools. Sounds strange but ImageX is faster compared to DISM. So i stay at the old tools. Good workaround - you can do this with lots of packages, not just RSAT - anything that comes in an MSU can be extracted and force-installed (well, almost anything). However, it does only install the RTM bits, as you said, whereas having the tools installed and then upgrading to SP1 does upgrade the RSAT binaries to SP1 levels. Just as long as people are aware of possible issues, bugs, and limitations of using the RTM tools on an SP1 system, and are willing to take those risks, I say go for it . Good workaround - you can do this with lots of packages, not just RSAT - anything that comes in an MSU can be extracted and force-installed (well, almost anything). 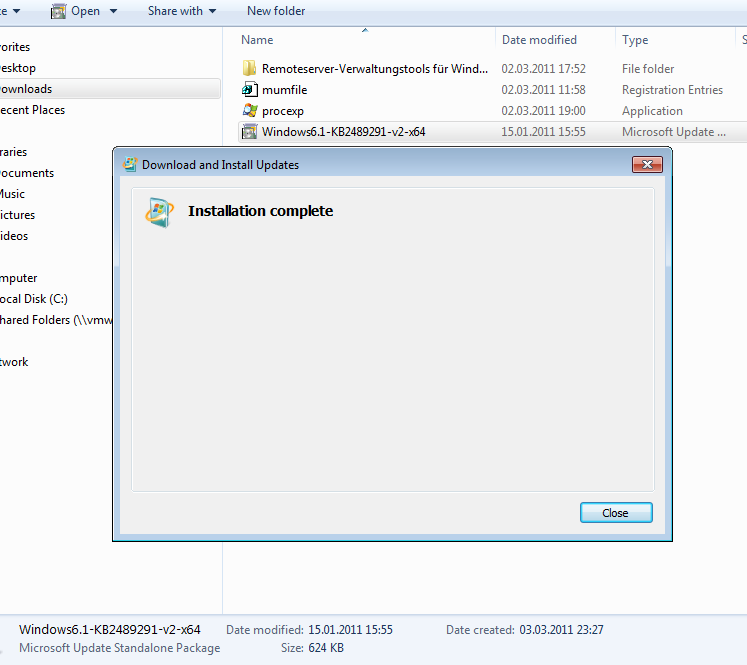 I know, I do this to get the old NTBackup reader working on a German Windows7. The NTBackup Reader update checks for English MUI. However, it does only install the RTM bits, as you said, whereas having the tools installed and then upgrading to SP1 does upgrade the RSAT binaries to SP1 levels. after executing the pkgmgr command it will take a few minutes without anything – no progressbar or anything – just nothing. After a few minutes (10 – 15 minutes) you’re prompted to reboot. 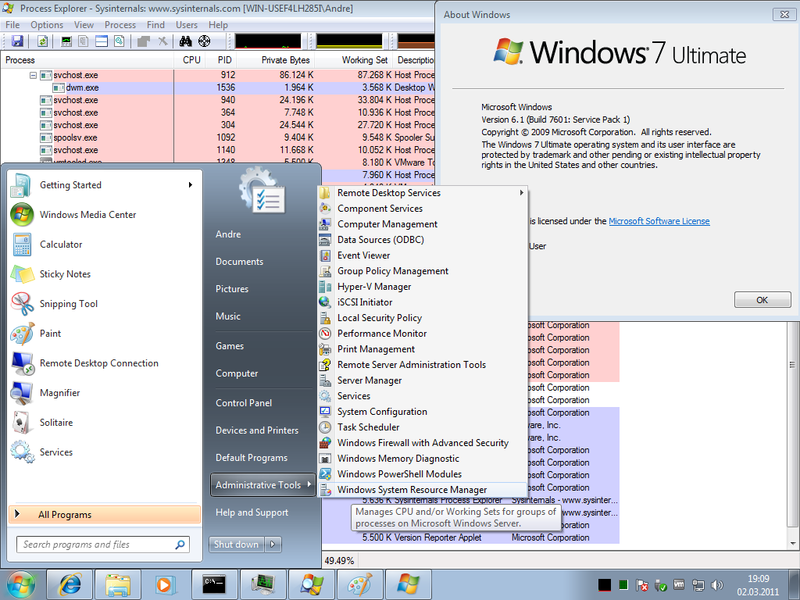 Then go so control panel -> windows functions and add install the remote admin stuff you want to use. Note: also works for windows 7 home premium. 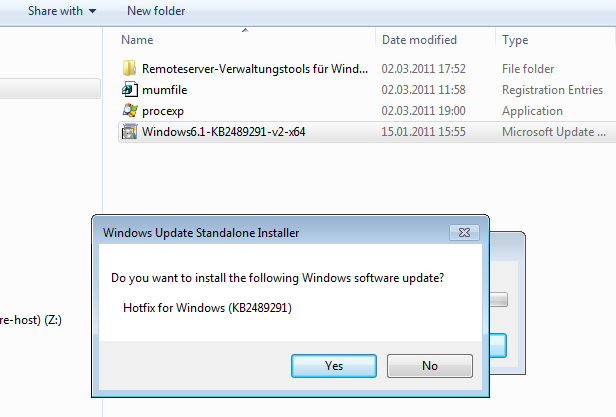 no, as you can read this doesn't work and you get the old RSAT tools With my way you get the Sp1 Tools. have you made the topic sticky? Ok. Good enought. All works out. However, need the same thing for the Windows Media Remote Server Tools. I can probably get the items out of the MSU, but how to go find the SP1 updates to add? Cannot figure out the install for Remote Server Administration Tools for Windows Media Services. I can get the MUMs installed and it even shows up in Windows update as being installed. However, the RSAT for Windows Media Services does not present itself on the MMC choices!!! Probably want to make a new thread for that or take it into PM until we do (or do not) get a definitive working install for that component. That way this thread stays "clean", at least as much as possible. I hope you figure it out though.